We’ve got the right uniforms, poms, and accessories for every athlete. Plus, there’s plenty of apparel and other items for mom and dad to celebrate their star. 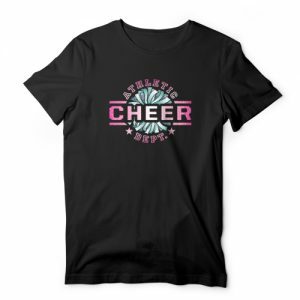 Throughout the year, we also offer a variety of Cheer Promo items designed to help you save on purchasing an entire cheer uniform. 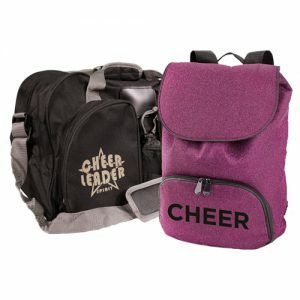 Please purchase the uniform, promo package, or other kits that match your student’s cheer category. To learn more about JV, Varsity, All Star, Elite, and other designations, please see the Cheerleading Home Page. ActivStars merchandise and equipment are purchased at wholesale prices in order to make our program the most cost-affordable for students of all backgrounds. You can order necessary items at practice through order envelopes or here on our online store. We do have some items that are required for participation. Every ActivStars youth cheerleader is required to have poms for class. 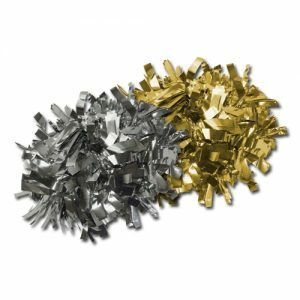 Students who participate in the Showcase are required to have the metallic team-level poms. Unfortunately, poms are not available for refund after purchase. Cheer uniforms are required only for special events, such as Showcases and Competitions. Attendance at these events is not required for participation in our program. These uniforms may be purchased from instructors at a class or through our website. We recommend you discuss the uniform purchase with your specific instructor. With our NEW team uniform design and look we know that you want your athlete to have her or his "perfect" fit. To help with that, we’ve provided a set of uniform size charts that are available at the bottom of this page. To keep the size and color, we recommend washing these uniforms in cold water with no bleach as well as air dried on a hanger. For athletes who make our stunt teams, patches will be made available. These are to be placed on the right side of the uniform top, right above the silver sleeve o the arm in the black section. Please sew the patch on because they are not iron-capable.